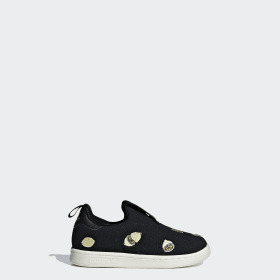 The Stan Smith has changed little since first donned by its namesake in the early 1970s. And why should it? The simple sneaker has become synonymous with classic, understated style and fresh, urban dressing. Stan Smith tennis shoes stay true to the look of the original, with its crisp leather build, low-profile shape and clean trim. Stan Smith sneakers get their title from the tennis star of the same name. The silhouette was first released in the late ‘60s, then renamed the adidas Stan Smith in the early ‘70s. At the time, the two-time Grand Slam singles and five-time Grand Slam doubles champion was known as one of the best players in the world. Over the years, the all-American shoe has evolved from athletic sneaker to fashion icon, appearing on runways, sparking collaborations and inspiring numerous variations on the theme. 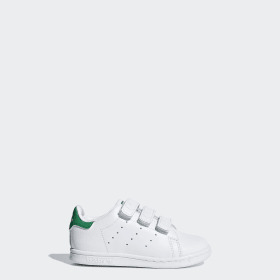 The signature Stan Smith features an unfussy white colorway punctuated by a patch of vivid green on the heel and a line drawing of Smith’s face on the tongue. Stan Smith sneakers feature three rows of barely-there perforations to represent the 3-Stripes heritage.